"Gene Davis with points," is how one painter described James Little's new body of work, De-Classified: New Paintings at the June Kelly gallery. He was joking, of course. 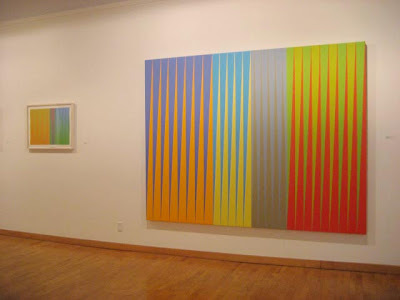 Davis may be a visual antecedent, along with Barnett Newman and maybe Kenneth Noland, but I'd describe Little's new work as "Geometry with finesse." Here is an artist who's making hard-edge paintings with a soft material, oil and wax in an encaustic-like mix, and making it work. Over and over again. He has combined lushness of material with preciseness of image. And he's working large. As someone who paints with wax, I can tell you that this combination of hard and soft, in large scale, is no easy achievement. 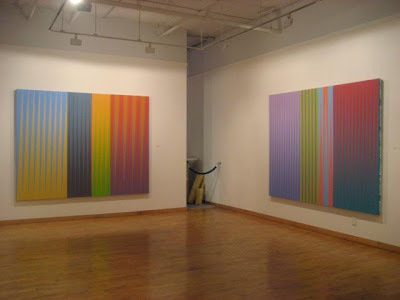 Formally, these resolutely abstract paintings would seem to be about figure and ground, or more precisely about the ambiguity of figure and ground, and thus about the ambiguity of space, and about color and control, flatness and expanse. And certainly about chromatic rhythm. 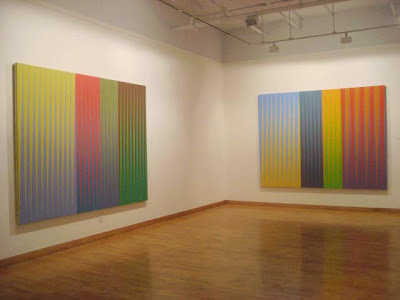 In these paintings, sawtooth elements are placed in side-by-side in discrete segments (occasionally a Davis-like band of stripes changes the visual cadence). As the angles of different colors, sometimes near complementaries, slide into one another, a mirage-like shimmer hovers over the surface. 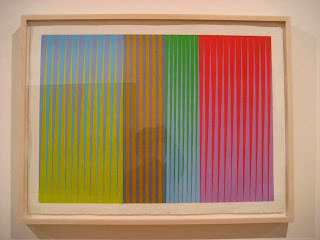 It's in no way Op in the manner of Bridget Riley, but it is retinally invigorating. 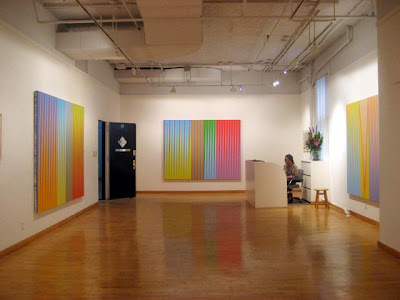 Little's paintings are technically virtuosic and visually ravishing . His palette, saturated and opaque, has just a touch of white. It's far from pastel, yet there's an alluring softness to it. 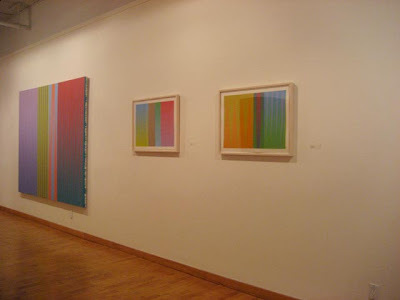 The show is up at the June Kelly Gallery in SoHo through June 9.
. Geoform, an online resource for abstract geometric art. Hi, very luscious! Question, when you say oil and was, is the image painted first in oil and then overlayed with a clear or colored was. I also work in encaustics (novice), so would be interested in knowing more about the technique. oops...fingers too fast typing, meant to say wax, rather than was...in the previous post. sorry. The hard edges and soft colors create a pleasing contrast. I am impressed with the technique of using an "encaustic-like" method on canvas. I'd think this would have to be done very carefully to avoid cracking on the flexible support. I'd be interested to know how the artist addresses the potential for cracking. I apologize that I'm ignorant about encaustic, but I thought you couldn't use it on canvas. Apparently you can...? I don't know for sure what/how he's using. I'm reporting with the information available from the gallery checklist. But if we extrapolate from the Brooklyn Rail article--which is a nice, wide-ranging interview that covers a variety of issues--it would seem that he's melting and mixing the oil and wax together. I want to say something about encaustic and materials here. 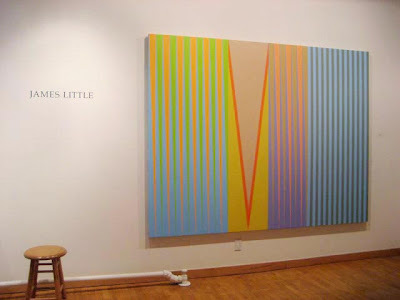 The point of this post was not to talk about Little's technique--which I know nothing about--but about the esthetics of the work and its formal issues. True, his combination of hard and soft is as a result of the medium he uses,and I find that most appealing, but the how-to is not my concern. This is one of the reasons I don't write too much about encaustic on this blog. I want to talk about art and ideas, not about what size brush and how much wax and oil. Those are valid questions, of course, but they're for a different forum. So no more technique questions in this post, everyone, OK? Well he and I transversing some of the same territory. I'd love to see them up close. Thanks for this. -his color sings and makes me feel optimistic and that life is good! Sorry to throw a damper on all this but I was sorry to see Riley's device used in this fashion. Whilst I have seen Riley originals it is true that I won't be able to get to see Little's show but from where I sit they seem a very pallid reflection of what the former achieved. No damper. You haven't see these paintings except through the lens of my little camera and then the medium of your monitor, hardly a sufficient basis for cmparison. True Joanne - but the comparison was in the drawing & that is a sufficient base. Joanne, thanks for covering these great shows in your blog. Your reviews are really educational. 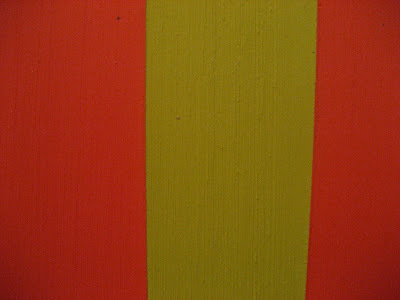 As for James' work, it seems very lush at first glance but then I see a lot of tension and conflict. They seem to be a real struggle, both in the making and looking. Tension. Yes! Thanks for that word, Rob. The tension is exquisite. Thanks again for pointing me to this show, and for covering it here. 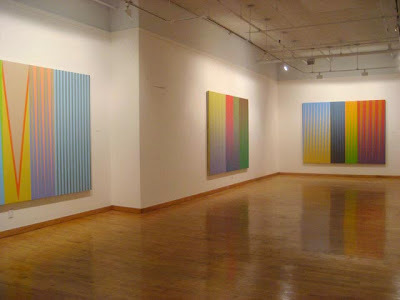 I liked these paintings a lot. Marketing Mondays: Are There Too Many Artists?